HEMP, what is it ? Hemp is a plant with similar properties to the flax plant, you will have heard of hemp rope I expect. 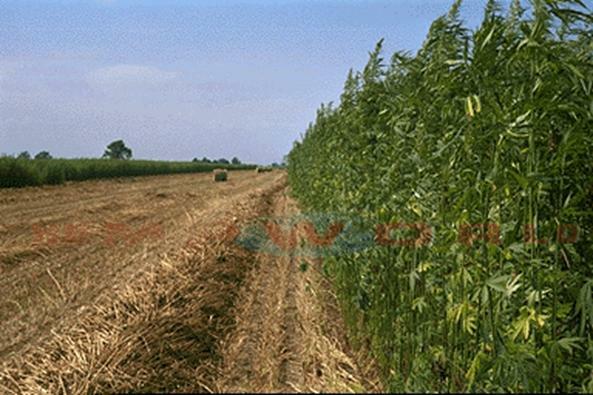 Hemp grows 2-2.5 meters (6-8 feet) tall in one season, stalks 5-15mm in diameter, plants grows close like wheat and barley, with dense foliage. 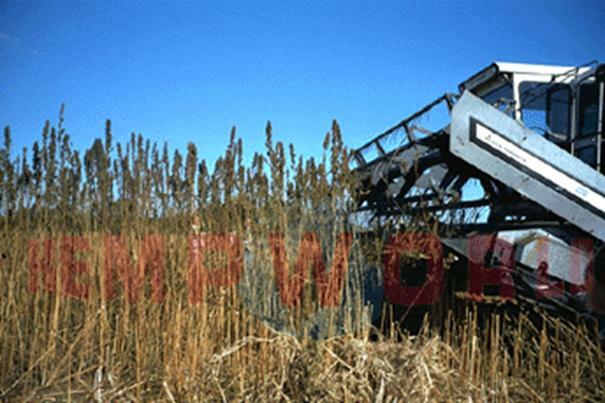 Hemp is processed by crushing the stems, separating the fibres on the outside from the woody core. The Fibres and the seed are the valuable part of the crop. The woody core or shiv is cut into little chips; this previously a waste product is what is mixed with Lime in construction. Hemp was widely used until the advent of synthetic fibres in the 1940-50s; it has many uses such as in rope, clothing and hundreds of other applications in the household and the construction industry. Hemp has been successfully used in France and Germany for house building for the past 10 years; the use of hemp fibres in plaster has its origins going back to the Romans. The use of lime and organic materials was widely used in Ireland prior to the arrival of the Normans, when timber frame building was the common form for non-ecclesiastical buildings. Current methods use the hemp shiv; specifically using hemp shiv in a lime mix is a modern adaptation of an ancient idea. Lime mortar has a proven record as a very durable material, in Ireland we have many examples of buildings surviving for 500-1000 years and in Rome many buildings are much older. There are many lime render finishes on buildings over 200 years old and still in good shape. Hemp is one of the world’s strongest natural fibre, it has been used to make cloth and rope for over 10,000 years, indeed archaeologists believe hemp to be the first plant grown for reasons other than food. Hemp can be used to make virtually anything that is currently made out of cotton, timber or petroleum. Until 1883 more than 75% of the worlds paper was made with hemp. Hemp was one of the ancient world’s most important crops. Renowned for its properties in combating skin and respiratory diseases, it was also used in the manufacture of a wide range of fabrics. Hemp is one of the world’s oldest and most versatile plants. Its first recorded use dates back to the Egyptians in the 16th century B.C. and was domesticated from a wild plant by the Chinese who developed breeding, farming and processing techniques. The fibre was used for textiles and the seeds were used for both food and medicine. Herodotus records that the Ancient Greeks used hemp to manufacture high quality fabrics and by the 9th century hemp was being used to make rope and textiles in Europe. When the art of papermaking arrived in Europe from China in the 14th century, hemp was used in the manufacture of paper. The Normans made growing of hemp compulsory in their feudal system in Europe, England and later Ireland. During the heyday of European maritime expansion hemp fibre was of vital importance to the French, British and Spanish fleets in the manufacture of ropes and other fabrics. In America, the original Levi’s jeans were made from hemp. George Washington and Thomas Jefferson both grew hemp. The Declaration of Independence was drafted on hemp paper. In the 19th century cotton displaced hemp from the textile market and paper was also produced from other fibres. Hempseeds, a by-product of the fibre, fell out of use; this was the beginning of the decline of hemp. By the early 20th century, hemp had become a niche crop in most industrialised countries in the western world. It was very important again during the Second World War, the Americans coined the slogan “Hemp for victory” and it when it became a very important industrial crop. With the advent of synthetic fibres in the 1950’s the use of hemp declined dramatically. Political pressure from the chemical and timber industries (manufacturers of synthetics such as nylons and polyesters, and the timber industry as producers of paper) with the pretext of drug reform and concern of potential abuse. The hemp plant, cannabis sativa is a similar plant from which marijuana is harvested, industrial hemp however contains only trace quantities of THC the active drug in marijuana and is of NO use to drug users. Banning it is a little like outlawing your garden poppy plants because in Afghanistan they grow a similar poppy to produce opium. Hemp cultivation for food and fibre has more than doubled between 1990 and 1997. E.C. subsides for hemp cultivation were introduced in the early ‘90s with the first cultivation licenses being issued in Holland, Germany, Italy and the U.K. This re-emergence meets the rising demand from ethical and environmentally friendly consumers for hemp textiles, body-care, health products and for the building industry. In France and other European countries, thousands of hectors of land are now dedicated to growing hemp; it makes a marvellous rotational crop between grains. With the changes in farm subsidies and hemps’ potential as a cash crop for farmers it is regrettable that this crop has not been supported in Ireland as it has been by the French and other European governments. In France the hemp organization, Construire en Chanvre, (construction with hemp, web site: http://www.construction-chanvre.asso.fr/ ), a membership organization of hemp growers, hemp manufacturers, Lime producers and hemp builders is financially supported and sanctioned by the French government to provide training, technical information and research to the industry. They are currently in the process of obtaining an Agremont certificate, which would make it easier for architects and engineers to speci fy the product and make it eligible for Home Bond approval. The current lack of these certificates does not prevent its use, but does require a knowledgably architect or engineer to have knowledge and faith in the product in order for them to put their name on any approvals or signoffs required from lending institution. Hemp can typically grow where cereals can be grown, and indeed makes and excellent rotational crop. It does not care for wet feet but otherwise is an easily grown and tolerant crop. Its deep roots assist in the aeration of the soil, extensive leaf droppings provide needed humus. It can be grown without the use of pesticides. The density of the plant and leaf material has the effect of suppressing weeds giving the following years crop an advantage and cutting down on pesticides that year as well. Hemp is also known to suppresses soil born pathogens, nematodes. In new Timber Frame housing, structured around the timber, like poured concrete, to form a solid masonry like wall. Usually poured at 200mm to 300mm (one foot) in thickness. It is a solid, no cavity wall. This wall surface is then plastered with a Lime based mortar to give it a normal looking finish both inside like a skim coat and outside like a nap or dash finish. In old stone buildings, on the inside of stonewalls to provide a vapour permeably insulation level to the stonewall; this method is an ideal and healthier alternative to dry lining. Dry lining only hides problems and in 5 years you get to smell them, studies have shown that 35% of dry lined buildings over 10 years old contain toxic moulds, imagine what this is doing to our children’s health and allergies. Hemp and lime is plastered on at 20-40mm over a fresh scud coat. Takes the cold shock out of the wall with an added insulation level. Cold stone walls create ideal conditions for condensation caused by typical fluctuating temperatures in domestic buildings, this leads to the formation of mildews and the resulting damp musty smells. Lime acts to absorb excess moisture and inhibits the growth of mould. Finish coat can be a lime plaster, finished to look like any normal standard plaster wall, modern or old. Lime or hemp is not a waterproofer, but acts to manage moisture, this is the best approach to damp problems in old buildings and is now the accepted method in the conservation industry, eliminate the source of moisture and manage the rest. The effectiveness of hemp was recently demonstrated in tests carried out by the top UK based engineering firm BRE (http://www.bre.co.uk/). A housing project in the south of England (http://www.suffolkhousing.org/) built some units in hemp and some as conventional insulated brick and block cavity walls. Over a 2-year test period the hemp buildings maintained a 2-degree higher temperature on average than the masonry cavity wall. That could translate into a 10-20% savings on heat bills, this was with a 200mm wall, 300 is now standard so a proportionately extra savings could be expected. A thermal image of the 2 buildings is shown below. IS THE WOODY CORE OF THE HEMP PLANT AFTER FIBOUROUS MATERIALS HAVE BEEN STRIPPED OFF. This is what is used for building material in buildings. Hemp grows to maturity in 100 days, is an ideal rotational crop and conditions the soil for future crops with its long root system. Because of the dense growth it kills off weeds below it, reducing the need for herbicides in any follow up crops. Hemp is both biodegradable and non-toxic. A large proportion of world chemical production is used to grow cotton. Hemp could replace many of the needs for cotton and can be grown in Ireland. Hemp is a compatible raw material for many industries due to its production of three raw materials, baste fibre, the hurd and the seed. Hemp paper is of superior strength, and folding endurance, which will outlast wood pulp paper by a factor of ten. Hemp on an annual basis produces more pulp per acre than trees with considerably less risk involved. 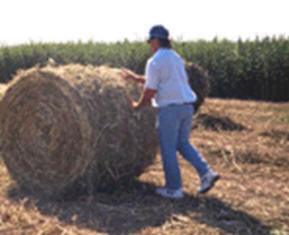 Hemp hurd is largely cellulose and is able to produce biodegradable plastics. Hemp biomass fuel produces no sulphur and can be effectively used as a relatively clean power source due to its 95% fuel to feed ratio. Hemp construction materials are now widely used in France where houses are being built utilising hemp as an insulation substitute, and hemp medium density fibreboard (mdf) as an alternative to wood fibreboards. The Hemp used for this wall insulation method is the hemp shiv, the woody core of the hemp plant, previously a waste product and now often used as horse bedding. The construction industry is responsible for nearly 30% of Irelands CO2 emissions. The production of Portland cement being a particular heavy producer. A hemp building has the potential to be CO2 negative, growing hemp plants for insulation, and trees for the framing both result in CO2 absorbsion. The use of hemp on a wide scale could help substantially in the reduction of CO2s as is now required under the Kyoto and European agreements. A hemp house could potentially be 90% Irish made and grown, the timber for the frame from our timber industry, the hemp for the walls from our farmers, lime an abundant commodity from our quarries. Ireland is still significantly an agricultural economy; growing hemp could be a substantial cash crop alternative for farmers, as subsidies on other products are phased out. In France already thousands of hectors are now dedicated to hemp production. We are being left behind.